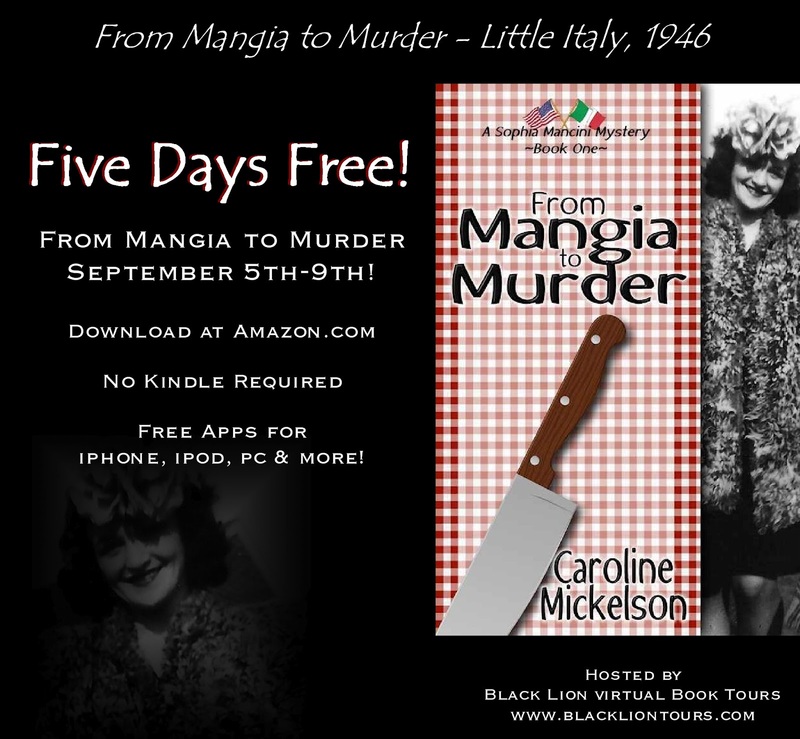 Caroline Mickelson's FROM MANGIA TO MURDER Blog Hop! It's Five Days Free for book one of Caroline Mickelson's, Sophia Mancini Mysteries! Little Italy, 1946 - Sophia Mancini would have enjoyed the grand opening celebration of her family’s private detective agency if the volatile chef at Vincenzo’s Ristorante had actually survived the meal. But before Sophia’s chilled spoon hit the spumoni, someone plunged a knife into Vincenzo’s back and the word on everyone’s lips went from mangia to murder. Sophia soon finds herself trailing crime boss Frankie Vidoni, chatting with his mouthy mistress Maria, and dodging henchman Mooch DiMuccio. She’s suspicious of Vincenzo’s widow, Stella, and his assistant chef, Eugene, because they don’t appear the least bit dismayed by Vincenzo’s passing. There is no conversation Sophia won’t eavesdrop on, no question she won’t ask, and no danger she won’t face to find the killer. “So you’ll be the brains of the operation? And what does that make me? Just a pretty face?” He pushed away from the table, frustration etched on his. She waited while her brother settled himself across from her once again. He drained his wine glass and poured another, a sure sign that he was as worried as she was. Her brother wasn’t a drinker. Angelo didn’t respond to her attempt at humor. This serious, sad man across from her was altogether different from the young, happy, confident man who’d shipped out to fight with the Allied forces three years ago. Home four months now, he was struggling with a head injury that had obliterated his short term memory and ability to retain details. If that wasn’t bad enough, he’d shipped out a married man with a beautiful young pregnant wife he loved beyond reason. He’d come home a widower to find that Luciano, his toddler son, didn’t know him from the milk man. Added to the pile of worry and stress, Angelo’s memory problems made returning to work as a police officer impossible. In turn prompted his in-laws, who had never approved of their daughter marrying an Italian-American beat cop, sued for custody of little Luciano. What little Angelo hadn’t already lost, he now stood to lose. The judge granted them thirty days to prove they could start a viable business. Tears pooled in Angelo’s eyes. Anger burned in Sophia’s heart. She grabbed her brother’s arm and shook him, desperate to snap him out of his sad state. His helplessness scared her more than her own rage did. She held her breath and waited for an answer. A single tear slid down his cheek. The only sound in the room was her brother’s heart breaking. He refilled his glass and raised it. Sophia grinned and raised hers. “A la famigilia,” they toasted in unison. To the family. Thank you for hosting Caroline today!